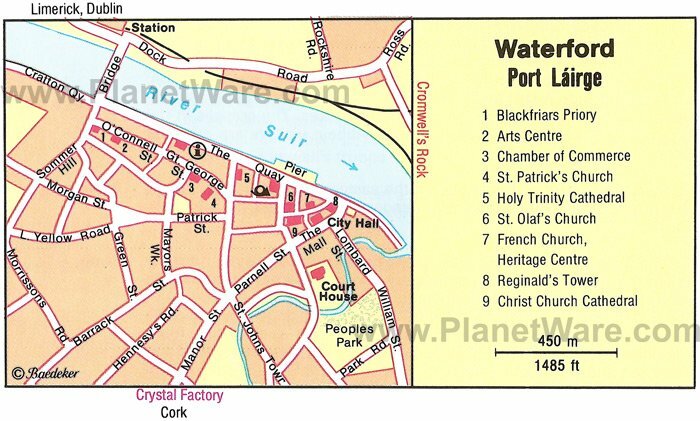 Waterford, in Ireland's south-east, lies roughly midway between the capital Dublin (166 kilometers) and Cork (122 kilometers). Trains and buses connect from both cities. Rosslare, with ferry connections to Britain and Europe, is about an hour away by car. Located where the River Suir is broad and deep, the city is a port of considerable importance. Waterford is famed worldwide for its handmade crystal, Waterford Glass, but sadly, most manufacturing now takes place in other countries, although some is still produced here. The city has a colorful past, from the Vikings to Norman Warrior Strongbow and the Cromwellian siege during the 1600s. Around 35 minutes drive from Waterford city is elegant Curraghmore House, presiding over 2,500 acres of formal gardens, grazing fields, and forests. This is the home of the 8th Marquis of Waterford whose ancestors came to Ireland from Normandy in the 12th century. Of particular note is stone-arched King John's Bridge, built in 1205 and the oldest bridge in Ireland. The Shell House, a folly built by the Countess of Tyrone in 1754, is also fascinating. In order to indulge her plan, she apparently instructed Ship Captains at Waterford Port to bring her back shells from around the world. About 70-minute drive from Waterford, The Rock of Cashel is Ireland's most visited heritage site. "The Rock" is, quite simply, iconic. Often shrouded in mist and rising out of the landscape, the castle raises many a goose-bump upon first sighting. When lit up at night, it takes on an otherworldly dimension. Also known as St. Patrick's Rock and Cashel of the Kings, this sacred site's buildings mostly date from the 12th and 13th centuries when it became church land. Prior to that, it's said that this was the seat of the High Kings of Munster and the place where St. Patrick converted King Aengus of Munster to Christianity in the 5th century. Adjacent to Christ Church Cathedral, the Medieval Museum honors Waterford's medieval days. The cloister hall is particularly eye-catching as are an array of vestments, a medieval depiction of King Edward III, and a hat once belonging to the notorious King Henry VIII. Waterford's principal Protestant church, Christ Church Cathedral (1779), stands beyond the City Hall and the Theatre Royal. 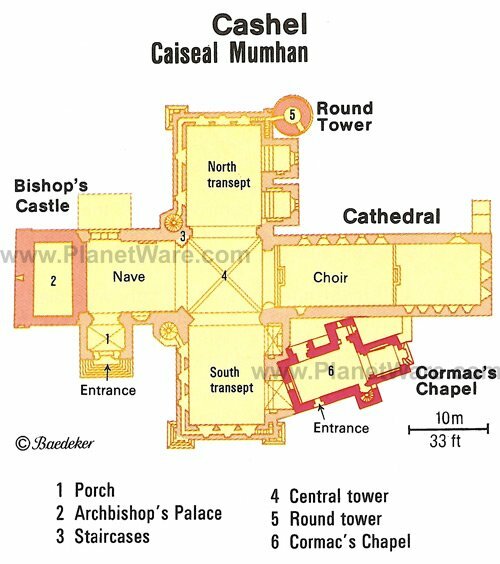 The cathedral has a spacious interior and two fine tombs, the Rice monument (1469), and the Fitzgerald monument made of Carrara marble. On the south side is the Bishop's Palace dating from the 18th century and restored in 1975. Waterford was once Ireland's second city and a place of considerable wealth built on trade, a fact that's reflected in many fine stone buildings dating from the 18th and 19th centuries. A stone's throw from Christ Church Cathedral, the Bishop's Palace dates from 1741 and was designed by Richard Castles. Here visitors can see, amongst many other items, the oldest surviving piece of Waterford crystal in the world, a cut-glass decanter dating from the 1780s. The museum not only focuses on Georgian times but also takes visitors on a journey from the mid 1700s to the 1970s. Exhibits include rare period paintings and items of furniture. Following years of industrial disruption and dispute, the new owners of Waterford Crystal opened a manufacturing facility and visitor center on The Mall in the heart of Waterford. Here visitors can take a guided tour and see first-hand the process behind the finished pieces of cut glass. The factory melts 750 tonnes of crystal per year and uses it to create items of exquisite beauty. Of particular interest is the glass-blowing process. Since opening, this has rapidly become one of the city's top tourist attractions. About 70 kilometers from Waterford lies the scenic heritage town of Lismore perched beside the River Blackwater. Stunning Lismore Castle is sure to catch the eye as it towers over the gently flowing waters below. Visitors should drop by the Heritage Centre for more information and there are twice daily walking tours at 11am and 3pm. Must do's include the stunning gardens at Lismore Castle, a visit to St. Carthage's Cathedral, the Towers Woodland Trail, (five kilometers outside town), and simply wandering the charming streets with their many coffee shops and restaurants. Just over 20 minutes drive from Waterford city (R683/684) takes visitors to the idyllic fishing village of Dunmore East. Described as one of the county's hidden gems, it's a popular place, particularly during summer months. A quaint harbor and beach lie alongside each other while the village is crammed with excellent seafood restaurants. Many of Waterford's well-heeled citizens either own or rent holiday homes here. In the vicinity, there are plenty of activities such as sailing, golf, tennis, walking, and watersports. At the far end of Waterford's Parade Quay, The Mall, an attractive street with a number of Georgian houses, branches off on the right at a sharp angle. On the corner is an imposing squat round tower known as Reginald's Tower, with walls three meters thick, said to be the oldest civic urban structure in Ireland. It's reputed to have been a part of the defences against the Vikings, but in its present form appears to be a remnant of Norman times. It now houses the City Museum and has at various times been a prison, a mint, and a military store. The exhibition includes historical and archaeological artefacts that trace Waterford's Viking heritage. Waterford Castle Hotel & Golf Resort: luxury golf resort, 16th-century castle, private island, claw-foot tubs, falconry. Granville Hotel: mid-range pricing, old-world charm, elegant decor, complimentary Irish breakfast. Waterford Marina Hotel: 3-star riverside hotel, central location, modern decor, secure car park. The Barley Field: budget bed-and-breakfast, clean rooms, in-room tea and coffee, free parking.